One of our favorite supplementary resources for our homeschool science class is the award-winning television show, The Magic School Bus. My three children who are in kindergarten, 1st grade and 3rd grade are huge fans of this educational television series and therefore, they were very excited to get hands-on with all of the science experiments in The Magic School Bus Engineering Lab. 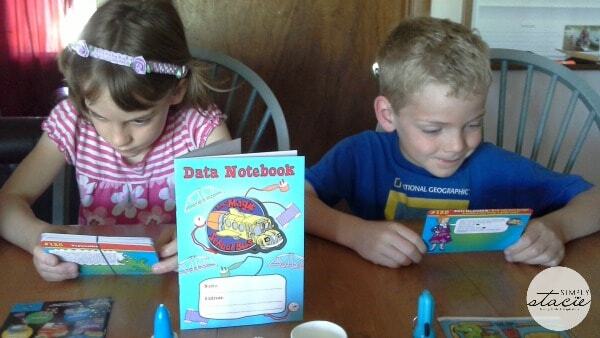 The Young Scientists Club has an exceptional line of science kits designed just for kids. Our personal favorites have been from The Magic School Bus collection so we could not wait to use The Magic School Bus Engineering Lab in our science class. This comprehensive science lab comes in a school bus themed storage bus that is visually appealing and perfect for elementary school aged children. “Seatbelts everyone”……as Ms. Frizzle and all the popular characters from the show will take your child along for a wild ride on The Magic School Bus in this adventurous science lab. The Magic School Bus Engineering Lab is literally packed with everything your child will need to hopefully inspire a life-long love for learning about science. Since the engineering field is not an area of expertise for me, I really appreciate that this science kit has everything that I need to help my children learn in a multitude of experiments that are not only fun but exciting too. My children had a blast while exploring the engineering field by building a solar oven, designing a car, constructing a bridge, discovered solar energy and so much more. 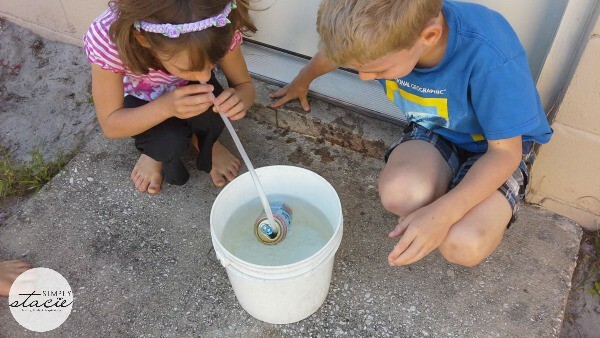 Their favorite experiment was creating a working submarine out of an empty soda can along with a few simple materials. My eldest son read the instructions included on the durable experiment card while my two younger children followed his directions in order to see the “submarine” (soda pop can) rise and sink in the water. The look on their faces was priceless as I could see them understanding the scientific principle applied within the experiment. Each new experiment brought similar reactions and my 8 year old son begged me to do additional experiments in his free time too. 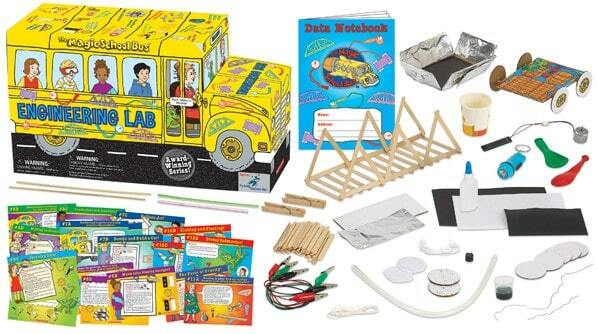 The Magic School Bus Engineering Kit is a bargain at $39.99 because it is packed with a ton of valuable materials including 33 experiment cards that are visually appealing, a data notebook so that my kids can record their designs and experiment outcome, a solar panel, motor, buzzer, electric wires and more. My boys in particular love to build like their father and are fascinated by machines so they were even more excited when my husband volunteered to help them design a car in one experiment….it was not only educational but a wonderful bonding experience for my three guys. My seven year old daughter was intrigued by the solar energy experiments and has asked me to learn more about this subject matter so she can “help the earth” when she grows up by becoming a solar engineer. 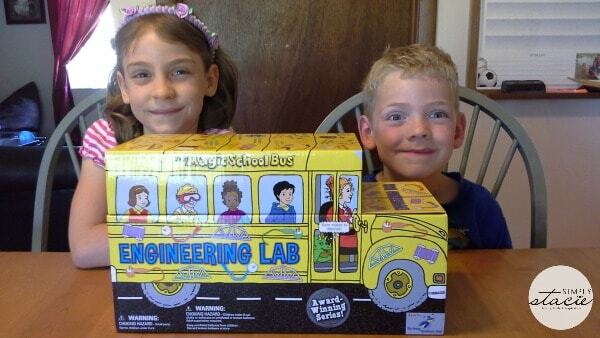 Designed for ages 5 and up, The Magic School Bus Engineering Kit is a wonderful science resource that has already inspired one of my children to dream about what it would be like to be an engineer when she grows up. This would be a great science kit to keep children learning over the summer break without even realizing that it is educational because it is so much fun. You are invited to visit The Young Scientists Club to purchase this kit and browse the entire collection of award-winning science kits for children. The Magic School Bus Engineering Lab would make a wonderful addition to your home or classroom and it would be a great gift idea too. Check out The Young Scientists Club on Facebook for lots of free home experiments too. I like the Clifford food science set. My son would love the Awesome Bubbles kit. Science on a Tracking Expedition. Thanks so much for the chance to win.